With adult-use sales still at least a year out in Maine, the gray market for cannabis is burgeoning – largely at the expense of the state’s regulated medical marijuana industry. 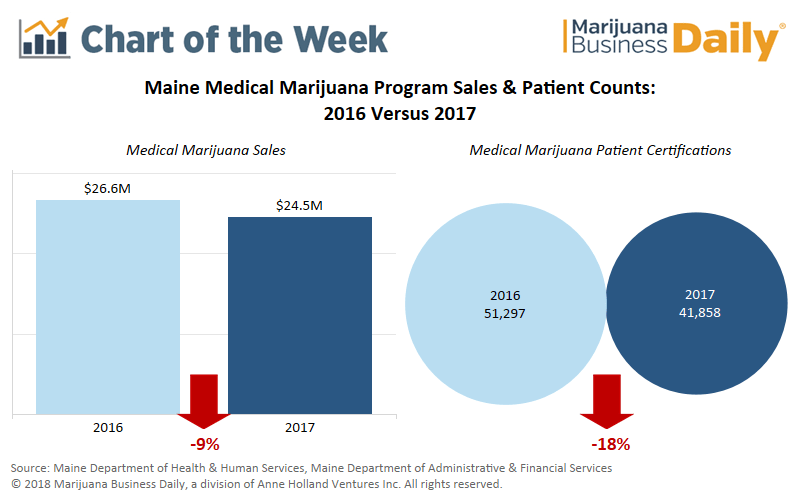 Sales of MMJ through Maine’s eight licensed dispensaries fell by over $2 million in 2017 – a 9% decline – on the back of an 18% drop in printed medical cannabis patient certifications. Maine has a voluntary MMJ patient registry, so printed patient certifications are used to approximate patient counts in the state. Though not a perfect measure – it includes anomalies like reissues of lost certifications – industry experts believe it’s within 5% of the actual number of patients. Although Maine’s adult-use industry is stuck in political limbo – recreational cannabis sales are not likely to begin until 2019 – it is legal for adults older than 21 to grow, possess and consume marijuana in the state. The sale of marijuana, however, remains illegal outside the medical market. Patients are required to have a valid, written recommendation from a physician to purchase MMJ from a caregiver or dispensary. That’s caused confusion for some patients, who chose not to renew their MMJ recommendation because they believed it was no longer necessary. That legal disconnect – where cannabis is legal for anyone over 21 but can’t be sold outside the medical market – is being exploited by an increasing number of gray-market operators. Adults can “gift” up to 2.5 ounces of cannabis to another adult in Maine as long as they don’t receive anything in return. Several businesses in the state have begun leveraging this loophole, selling products unrelated to cannabis – such as T-shirts or soft drinks – at inflated prices and including a “free” amount of marijuana with their purchase. Other individuals offer delivery services, where the marijuana is free but the cost of delivery scales to the amount of cannabis being provided. A simple search for “marijuana” on the Craigslist’s Maine page results in several such services. While gray-market suppliers are unlikely to have the product selection of dispensaries – which offer concentrates, edibles, topicals and flower – cheaper prices and the convenience of delivery has proved more than enough to sway patients away from dispensaries. Medical marijuana industries tend to contract in states that go on to legalize recreational cannabis. For example, MMJ patient counts have fallen in Colorado, Nevada and Oregon. Unless lawmakers make a concerted effort to crack down on gifting, dispensaries will need to go above and beyond what gray-market operators can provide in terms of quality, service and product selection to hold on to their shrinking customer base.